A staging area that contains messages that have been sent and are waiting to be read. Note that, contrary to what the name queue suggests, messages don't have to be delivered in the order sent. 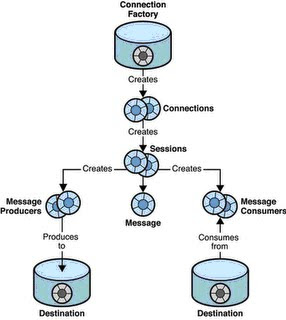 If the message driven bean pool contains more than one instance then messages can be processed concurrently and thus it is possible that a later message is processed sooner than an earlier one. A JMS queue only guarantees that each message is processed only once. A distribution mechanism for publishing messages that are delivered to multiple subscribers. A good analogy for this is an anonymous bulletin board. It is recommended to use JNDI lookups. This promotes loose-coupling - an important aspect of SOA.